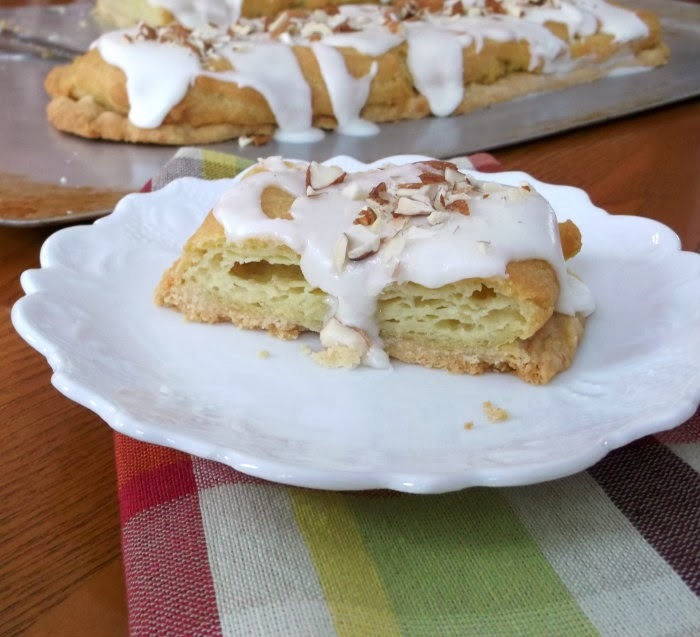 I was looking for something on the web (I don’t remember anymore what it was) when I ran across this recipe for the Danish puff I am writing about today. Thoughts of eating healthy flew out the window and all I could think of was this Danish, it looks so delicious… I guess that is not entirely true, I am still eating healthy. I feel that you have to indulge a little bit once in a while. So I made this and I gave most of it way because I knew I would want to eat all of it myself. This Danish recipe is not your traditional Danish recipe; there is no yeast so no waiting for it rise, but it is very similar to the dough that you would make for a cream puff. But the end result is truly amazing. 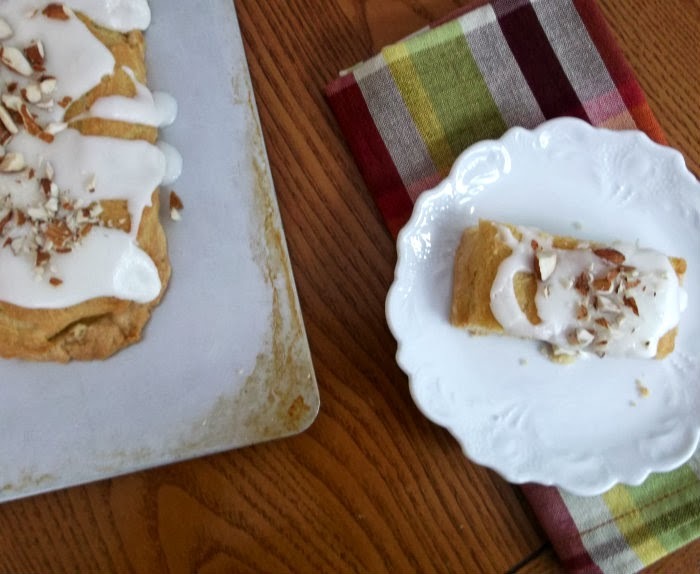 There is almond extract that is used in the dough and in the icing which plays a large part in the wonderful flavor. If you love Danish like do, but don’t have a lot of time give this a try… it is amazing. 1. Heat oven to 350 degrees F. Place 1 cup flour in medium bowl. Cut in 1/2 cup softened butter, using pastry blender until particles are size of coarse crumbs. Sprinkle 2 tablespoons water over mixture; toss with fork. 2. Gather pastry into a ball; divide in half. Pat each half into 12×3-inch rectangle, about 3 inches apart on ungreased cookie sheet. The pan should be large enough to hold both pieces of dough, leaving 3 inches on either side of each piece of dough, for expansion. 3. In 2-quart saucepan, heat 1/2 cup butter and 1 cup water to rolling boil; remove from heat. Quickly stir in almond extract and 1 cup flour. Stir vigorously over low heat about 1 minute or until mixture forms a ball; remove from heat. Add eggs; beat until smooth. Spread half of the topping over each rectangle. 4. Bake about 50 minutes to 1 hour or until topping is crispy and brown, remove from pan to cooling rack. Cool completely. 5. 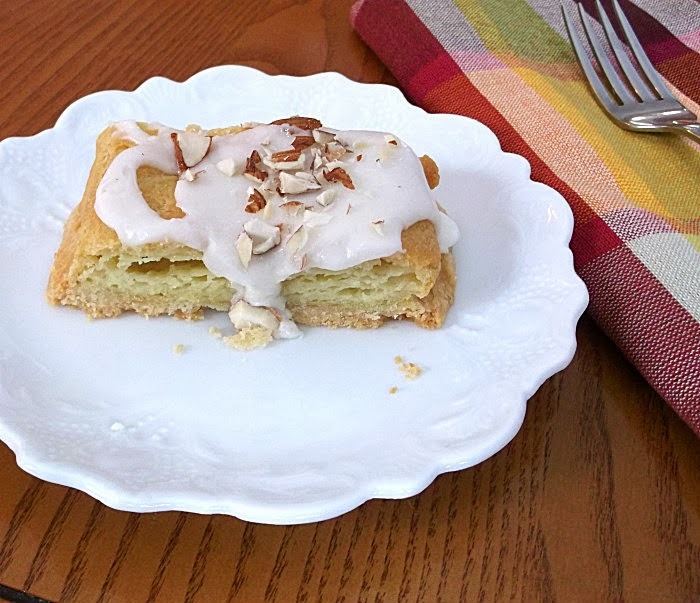 In a medium bowl, mix all glazed ingredients except almonds until smooth and spreadable. Spread over top of pastry; sprinkle with nuts. I wish I had one of these for breakfast!! We always try to give away most of what we bake so we won’t be tempted to eat it! And this is one we’d definitely have to give away – it looks wonderful! Thanks. I wish I had one to go with my coffee – they look delicious!